My phenology spot is located in the Champlain Valley, in the town of Winooski, on the banks of the Winooski River. I would classify the natural community associated with this observation spot as Riverside Outcrop.There several key features that led me to this conclusion. While the river is currently frozen and covered in snow, in the fall the geological formations, the banks and the swift movement of the water are in line with the Riverside Outcrop natural community. In the warmer months the grasses and undergrowth were healthy along the banks. Small wooded trees were also present, taking advantage of the nutrient rich soil at the river bank that is a characteristic of some Riverside Outcrop communities. 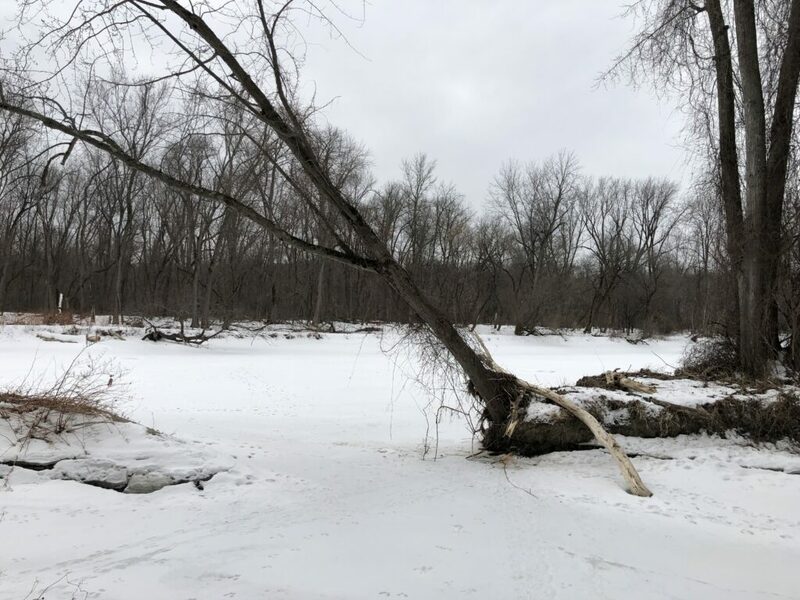 The movement of the water and the ice that is pushed through this section of the Winooski creates loamy pockets of soil that are nutrient rich and hold moisture (similar to what is found in floodplain forests). This is why my location also has some small woody trees. This natural community has faced human and natural disturbances that impact the ecosystem. For example, this fall a beaver constructed a dam with the sticky wooded plants in the area. It will take some time for those plants to regenerate along the banks (after the dam falls apart and nutrients are returned to the soil). In addition, in the 18th-19th centuries this area supported mills/manufacturing. The dams created to support the mills also disturbed the natural community. This spring, I anticipate that the banks and open area along the river bank will bloom with annual and perennial plants found in the Riverside Outcrop (columbine, loosestrife, cattail). Lastly, I expect to see birds and evidence of small mammals due the field area the borders the Riverside Outcrop. Ice, ice and more ice has formed on the surface of the Winooski River. The cold temperatures and the amount of precipitation led me to trust the ice and venture out to take in the perspective from the frozen river. Last time I did not quite trust the ice to be thick enough to walk on, but this time it was very sturdy. I was able to venture out to explore the little island that was off limits this fall due to the swift moving water. As I returned to the bank, I thought about hydrology and the winter discharge that is weeks away. Winter discharges are much higher than those in the summer, even when there is a lot of precipitation. I am curious to see how the river behaves this spring when the melt begins. I know that the water level of the main part of the Winooski River will grow and the velocity will increase. I imagine that the outlet at my observation spot will grow in width and the water will speed up, too. The water will hopefully enrich the soil to support the spring habitat growth. Winter by the Winooski is very different from what I observed in the late summer and fall. The textures and colors are gone. It looks dormant right now. Nothing is growing and the underwater animal activity is not viewable. The smattering of animal tracks, including deer and other small animals dot the snow and ice confirms that they have been living in the area. I suspected this, but it was harder to observe when the area is rich with vegetation. I’m excited It to witness the changes as we transition from winter to spring, including the rebirth of the habitat and unexpected changes and new discoveries.